Let something sit on my desk for a month and then find it later? What! No, never. I too love typewriters, and the physical act of typing as being distinct from writing, per se. There are times, while at work, that I can't wait for the weekend to roll around when I can being typing. I type for my blog, which I update at least weekly, but also for a personal journal. Sometimes typings start out as rough drafts potentially for a blog article, but end up not being published, as they might be of a subject matter or tone of voice not in keeping with my blog's theme, in which case they get merely archived in a binder. I also have found typing to be a practical form of data backup, for text-based data like passwords or one's cellphone contact list. Keeping multiple copies of such important information safely stored in multiple locations offers a form of security unmatched by other means. And if it's really important, a copy can be stashed in a bank's safety deposit vault. Recipes are also conveniently typed, along with grocery lists, which work well with a small typewriter kept in some handy location near the kitchen, with paper already threaded up to go. A spare machine in adequate working condition can also be kept in the trunk of one's car, as an out-and-about trunk typing machine, always available should the need arise, like a sudden coffee shop stop, or kid's soccer game, or a stop at the park on a nice day. Having an excess of typewriters as a collector-user, one has to find specific and creative reasons to use them throughout one's life. I also keep one in my car, usually so I can type after work. 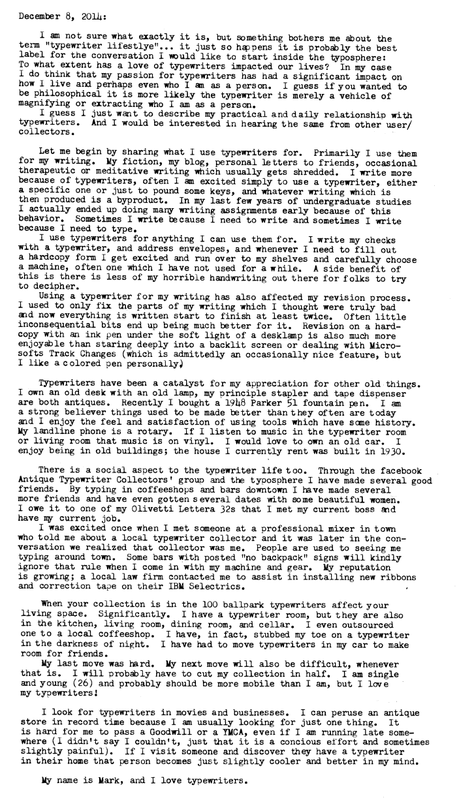 I enjoyed reading this, especially how the typewriters have affected your social life. I could go on all day about what typewriters have brought to my life, but a worldwide network of friends, acquaintances, and fellow enthusiasts is one of the best dimensions of this multidimensional interest. I'm glad I found this blog. We share similar interests and aspirations (like getting our fiction published). I too could go on and on about why I love typewriters so much, but like Richard said, I'd like to hear what everyone else thinks. Thank you very much! I hope you continue to enjoy this blog. I intend to post on it more often.